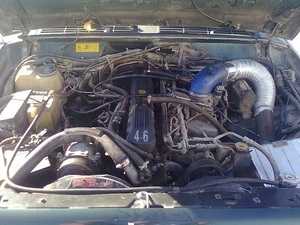 Lighter header, S-pipe, and muffler (13lb). The stroker engine is 15lb heavier than my old 4.0 so curb weight with half tank of gas reduced from 3525lb (1600kg) to 3450lb (1565kg). I'm very pleased with the results of my mods. The improvement in acceleration is noticeable and has occurred right across the road speed and engine rpm range. My Jeep now takes 7.3secs instead of 8.4secs to accelerate from 30-50 in 4th gear, and 11.1secs instead of 14.5secs to accelerate from 50-70 in 5th gear. Fifth gear now has more useful pulling power for highway overtaking manoeuvres. The engine pulls hard from as little as 600rpm right up to the 5200rpm rev-limiter. Part-throttle response is tremendous. About 80% of the acceleration is available with the throttle barely open. The engine also sounds more powerful with a throaty growl from the free-flowing exhaust. Now I enjoy the soundtrack from the engine whenever I blip the throttle, and the Jeep even rocks sideways under the engine's torque. Outputs at the flywheel have increased from a calculated 193hp @ 4850rpm / 239lbft @ 3500rpm to 235hp @ 5200rpm / 269lbft @ 4000rpm. At least 242lbft (1.0 lbft/ci) is available from 1600rpm to 5100rpm, and 80% of maximum torque is available at just 1000rpm. The "High Output" badge on the tailgate doesn't look out of place any more. Top speed is still an electronically-limited 116mph in 4th gear. Without the limiter, the Jeep should reach 128mph at 4830rpm in the same gear. Since this date, my Jeep has been powered by a 4.6L stroker engine developing a calculated 258hp @ 4850rpm and 320lbft @ 3500rpm (34% more horsepower and 34% more torque than stock). At least 278lbft (1.0lbft/ci) is available from 1500 to 4850rpm. The Jeep's performance with the stroker engine is simply awesome. There is so much torque that you can break the tires loose accelerating in 2nd gear on dry asphalt, and it'll also break the tires loose on wet asphalt in 3rd. The 0-60 time is down to 5.9secs and the 0-100 time is down to 16.8secs, an incredible 8.7 seconds faster than stock! In gear flexibility is also much improved; 30-50 in 4th is down to 6.1secs, and 50-70 in 5th is down to 8.9secs. Throttle response is snappy and quick overtaking manoeuvres require only small throttle openings. What used to be ludicrously tall gearing on the Jeep when it had the stock 4.0L engine is now ideally suited to the 4.6L stroker. The theoretical 132mph top speed arrives just past peak HP rpm in 4th gear, and the 1/4 mile trap speed of 95.2mph is reached at the top of 3rd gear. This is the engine the Jeep should have had in the first place! Gas mileage from the modified 4.0 averaged 20.8mpg so it was just about the same as when the engine was stock. Since the engine was putting out 22% more horsepower and 13% more torque than stock from the same amount of fuel, that's a major improvement in engine efficiency. * The 4.6L stroker engine is averaging 21.2mpg, which is 2% more than the stock 4.0 could manage so considering the performance that's available and the extra 15% displacement, the stroker engine is remarkably frugal. Replacing the stock rubber front and rear stabilizer bar bushings with polyurethane units reduced body roll during cornering. The Bridgestone Turanza 225/70R15H tires that are currently fitted to my Jeep are a big improvement over the stock Goodyear Wrangler 215/75R15 tires. The slightly wider tire with a lower profile also reduces body roll during cornering. The Bridgestones also have more grip than both the stock tires and the performance replacement 225/70R15H Goodyear Eagle GT+4's. Wheelspin from a standing start is reduced, cornering speeds are increased, and braking distance is shorter. My Jeep now handles better than just about any factory-produced SUV and even handles better than some performance sedans. It can now go faster round the corners as well as in a straight line, making it a real blast to drive.